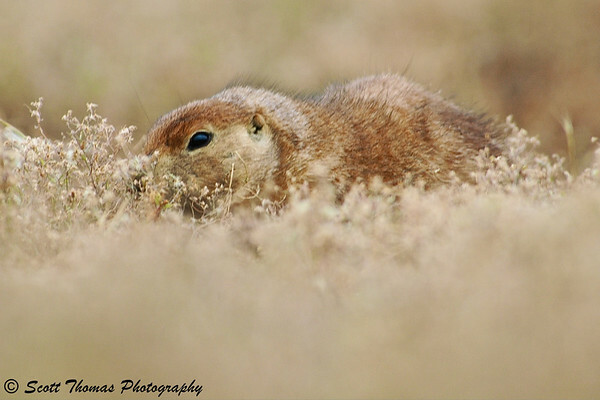 A prairie dog peaking out from his burrow at the Theodore Roosevelt National Park in North Dakota. Nikon D70/80-400VR, 1/400s, f/5.6, ISO 400, EV +0.3, 400mm focal length. As I tell people when taking photos of children or pets, getting down to their level will make for better photos. 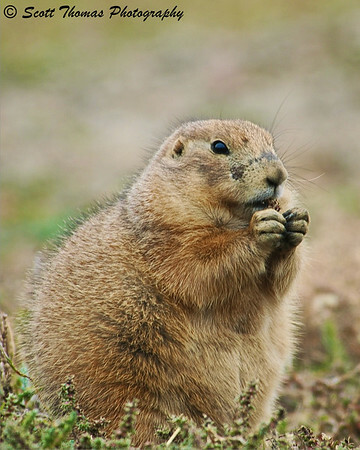 Prairie dogs are only about 12 to 16 inches high when they stand up. Much lower when on all fours. To get down to their level, I got out of the car I was photographing in and down on my stomach. I held the lens steady by propping myself up with my elbows. This put the lens about 6 inches above the ground. Using my old Nikon D70 camera with the Nikon 80-400VR lens giving me an effective focal length of 600mm (400mm times the 1.5 camera crop factor), I got some incredible photos at the eye level of the prairie dogs. A forging prairie dog. Nikon D70/80-400VR, 160s, f/5.6, ISO 200, EV +0.3, 400mm focal length. A prairie dog giving an approaching neighbor a bit of a threatening look. Nikon D70/80-400mm, 1/400s, f/5.6, ISO 400, EV +0.6, 400mm focal length. This entry was posted in Animals, Weekly View and tagged 80-400mm, bokeh, mammal, national park, nikon D70, Photography, prairie dogs, theodore roosevelt, vr, wildlife. Bookmark the permalink. Nice small friends you have got here, Scott 😉 – my favorite is the first one. Are these small “dogs” common around your local area? 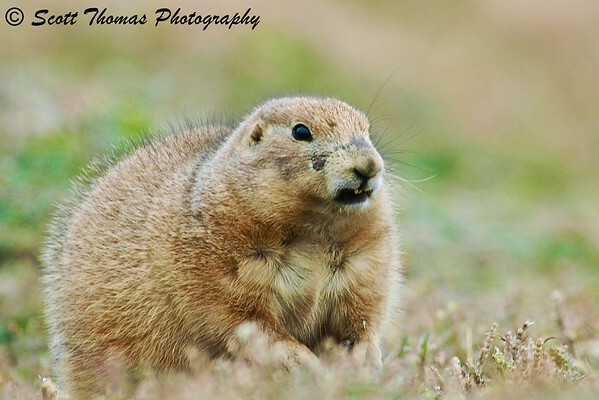 No, I photographed these prairie dogs in North Dakota. They are named for their bark which is very small dog like. In fact, they are ground squirrels who live in large towns or colonies in burrows. Thanks, Kathy. Shooting wide open is tricky. Now that is one chubby prairie dog! Nice capture of the lip curl in that last photo. Clearly not one for sharing his treats. Now look, more photos of the little cute fellow . The ones at Flick are very good, too. Thanks for mentioning Flickr. I put two more photos of the prairie dogs there. They are fine Scott. Always good to be in level with your target. I prefer the last one. Lovely photos – but rather you than me getting down to their level, they look like they might take a fancy to someone’s nose! Ah, that’s why I was using a long telephoto lens. Their teeth looked very sharp. Those are excellent, Scott! I really like that you got down on their level. It made great shots! This was easy hunting as these animals are used to cars and people near them. Much different if I tried this with the squirrels here at home. I’d be waiting a long time for them to get used to me. your depth of field is awesome in these photos and the bokeh shot is my favorite one. The 80-400VR lens has great bokeh when used wide open. Thanks, Consuelo. Great capture. The eye in the first photo is so captivating. I really like the top shot, just peaking out of the grass. I love shot number 2. I was down on my belly this past weekend too, trying to get a shot. It wasn’t of a critter though. LOL! It was just a fallen flower that I was looking for a different angle on. Very cute! I like the first one best, too.